When the 1952 presidential election campaign began, many assumed it would be a race between Harry Truman, seeking his second full term, and Robert A. Taft, son of a former president and, to many of his fellow partisans, “Mr. Republican.” No one imagined the party standard bearers would be Illinois governor Adlai E. Stevenson II and Supreme Allied Commander in World War II, Dwight D. Eisenhower.. I Like Ike tells the story of a critical election fought between two avowedly reluctant warriors, including Truman’s efforts to recruit Eisenhower as the candidate of the Democrat Party—to a finish that, for all the partisan wrangling, had more to do with the extraordinary popularity of the former general, who, along with Stevenson, was seen to be somehow above politics. In the first book to analyze the 1952 election in its entirety, political historian John Robert Greene looks in detail at how Stevenson and Eisenhower faced demands that they run for an office neither originally wanted. He examines the campaigns of their opponents—Harry Truman and Robert Taft, but also Estes Kefauver, Richard B. Russell, Averell Harriman and Earl Warren. Richard Nixons famous “Checkers Speech,” Joseph McCarthy’s anti-Communist campaign, and television as a new medium for news and political commercials—each figured in the election in its own way; and drawing in depth on the Eisenhower, Stevenson, Taft and Nixon papers, Greene traces how. 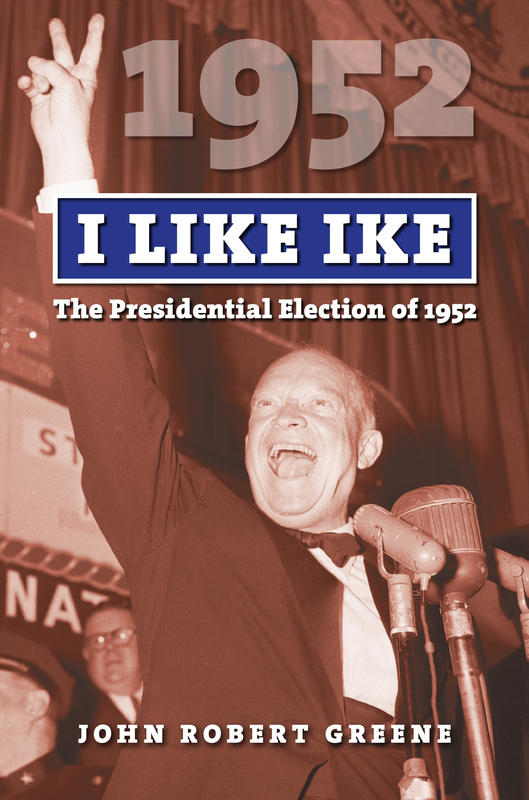 I Like Ike is a compelling account of how an America fearful of a Communist threat elected a war hero and brought an end to twenty years of Democrat control of the White House. In an era of political ferment, it also makes a timely and persuasive case for the importance of the election of 1952 not only to the Eisenhower Administration, but also to the development of presidential politics well into the future. John Robert Greene is Paul J. Schupf Professor, History and Humanities, Cazenovia College, Cazenovia NY. He is the author of many books, including most recently The Presidency of George H. W. Bush, Betty Ford: Candor and Courage in the White House, and The Presidency of Gerald R. Ford, all published by Kansas.